Lunar Hine: Exhibition, duck herding, puppets, etc. Ta-dah! At last, the exhibition's hung. All I have to worry about now is the increased risk of people seeing my work. Yikes. If you're in Devon, it's in The Courtyard Cafe, Chagford all September. 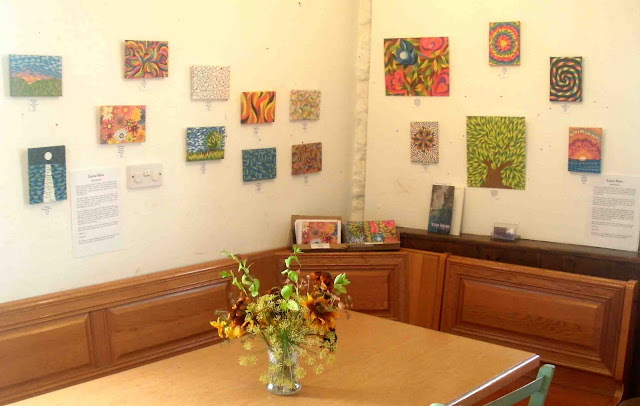 And do take a look at some of the great work being created in Devon Open Studios. We spent a day at Lustleigh Village Show. 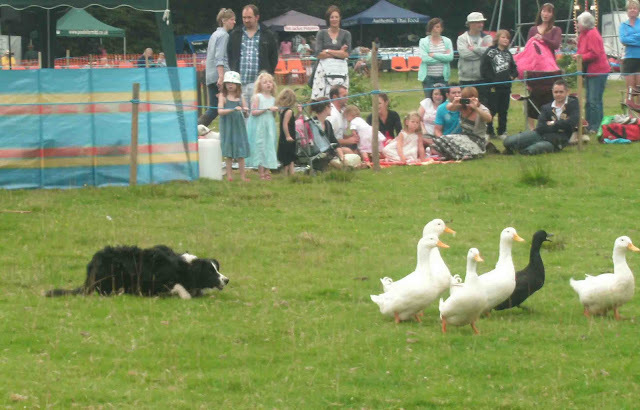 Many are the wonders to behold there, but the duck herding is possibly the funniest. Phenomenal birds of prey were on display. I had a quick stroke of this one, but flinched away when he looked (hungrily, I thought) down at my fingers. And while we're on birds of prey, I strongly recommend you visit Coyopa and read an extract of 'The Falcon's Child'. I was pleased to spot this woman knitting as she walked. She's a professional weaver and actually only looked down at her hands in shyness when I was taking her photo. We watched a hay rick being built in the traditional way, with help from Ed and Samson (below) from Chagfood. The kids had plenty of traditional entertainment too. This Punch and Judy show gathered a huge crowd. You can probably see from the photo how dark the story is, but the kids (young and old) were having a grand time yelling warnings and encouragement to the characters. I'd like to know more about the origins of this tale of a man, his wife, a crocodile and some sausages. ..their coats were whipped off in the sheep shearing speed trials. If a shearer nicks the skin of a sheep, his time is disallowed. There's genuine competition, especially between the old hands and the young upstarts, although everyone acknowledges not enough people carry this skill now, so outside the trials there's huge encouragement to the men (exclusively, it seems) who want to learn. Pickle went on a merry-go-round for the first time. She had so much fun and couldn't stop grinning afterwards. Last night we were at Yuli Somme's Bellacouche preview. In typical Dartmoor style, apart from the usual dogs and kids, a friend had brought a pony. And on the way home the sky was shining fire. I'd felt odd all day. Maybe it's autumn slinking into my bones, maybe it was the magical company the night before, or the early morning stroll through the sculptures in the Mythic Garden. But something is shifting in me; taking a new shape and creeping up, up to speak with a new voice. We never know who we'll be tomorrow. All I know is to face into the strongest wind and keep walking. All I know, is that when the Wild God visits, I will give him the best I have, and listen hard. Your work looks absolutely brilliant hung together in a collection - just wonderful! Lunar, your pieces look wonderful all together like that, they just sing in harmony. Again, I wish I could at least visit for a while, to see these wonders you speak of! I just had a little virtual ramble around the Mythic Garden, what a gorgeous place and such beautiful works of art. And thank you to for the link to Tom's wonderful, wonderful poem. Even just seeing the words 'The Wild God' makes my heart sing...he's very deep in all of us, and I too, will give him my best and answer when he calls! Good post. Just thought I would make a correction though - as we where leaving our ex-doctor / neighboring MP Sarah Wollaston was being given a go. She is a strange one - a conservative MP chosen by her constituency, not her party, and a champion for the NHS, against privatization... Very peculiar. And she was sheering sheep.... All the professional sheep shearers where men though. Wow! Your work looks fab!! Gee, you guys :o). Thank you. I've sold one of the originals and prints/postcards in little dribs. That's more than I was confident of selling and there's weeks to go! I've just completed another piece, so I'll photograph that with the rest. My Ent, I missed Sara Wollaston (who I still think of as 'Dr') shearing - I was chasing an awol toddler around a field. So, beautiful, the way all of your pieces look, and still that tree, oh that tree, stands out like a small beacon. Congratulations (sorry for the exclamations, but I am so proud of you, sharing your work, and putting it on display)!! And the picture of Pickle, what a doll, so joyous, so filled with light. I hope that means that her tiger side has subsided and if not, I hope that the thing shifting in you also has the speed of a Cheetah. Either way, I look forward to all the changes life brings you. Love. Lyra, thank you so much. That tree is attracting some admiration in the flesh (bark? canvas?) too. In truth, I am proud of myself. I still find it tough to walk into that cafe knowing my work's on the walls, but I'm assured it gets easier. Pickle's tiger side seems unlikely to abate, but she is a sweet and charming thing too; spontaneously kind with her peers and endlessly entertaining for us. And, you know, Mama has her own roar kept for when it's necessary.